Little is known of Charles Tessier. He was possibly the son of another composer of the name of Tessier, the Britton Guillaume, who in 1582 published (in Paris) a book of airs dedicated to the Queen of England. The traces left of Charles’ existence and musical activities date from the last years of the 16th century and early years of the 17th, including the publication of his two collections of “chansons & airs de court” (1597 in London, dedicated to Penelope Rich, sister of Robert Devereux duke of Essex) and “airs et villanelles” (1604, dedicated to Maurice/Moritz, landgrave of Hesse-Kassel, reprinted in 1610, now with a dedication to Mathias, king of Hungary). There is also a manuscript of lute songs now kept at the Bodleian Library of Oxford, “the only such example of a French collection of that kind between those of Adrian Le Roy (1571) and Pierre Guédron (1608)”. Tessier was a well-traveled musician – he is known to have spent some time in England, in Lorraine (then an independent duchy), in Marburg the capital of the landgraviate (or duchy) of Hesse-Marburg (not to be confused with the langraviate of Hesse-Kassel! ), and himself, in the preface to the 1610 collection, claimed to have “sucked the sweet nectar of those learned virgins the Muses and to have been admitted to their most delicious orchards of France, Italy, Spain, Germany and Arabia”. It is very likely but not established with certainty that Tessier met and befriended Dowland, as they gravitated in the same circle of protectors in Paris, England and Germany. As in Dowland’s collections (his first Book of songs or ayres was published in 1597, the same year as Tessier’s first collection), nine of Tessier’s songs exist in both forms of polyphonic madrigals in the two published collections and airs for solo voice and lute in the Bodleian manuscript. His traces get lost after 1610. The recital offers excerpts from his two collections and manuscript of lute songs (track 15, the air de court “Quand le flambeau du monde”, seems to combine both versions for voice and lute and polyphonic voices and, running over 8 minutes, is the most extended in the recital), and an alternation of the boisterous dance-like and popular-inspired, and the more “dowlandesque” refined and melancholy. Among the winners, there are The Turkish songs, track 1, the comical and bawdy Swiss song track 3 (written in a German-accented Italian mocking the language as it was probably spoken in Switzerland back then, and reminiscent of the comical madrigals of Orazio Vecchi – a near-exact contemporary of Tessier), Madonna di Coucagna track 8 with its imitation of bird chirpings (and “Coucagna” seems to be a play on the words Cuckoo and Cockaigne), the explosive “Vita ti voria dar” track 9 and the bawdy “Je suis par trop longtemps pucelle” (I’ve been a virgin too long), track 14. It says a lot about the care and fastidiousness that went into this production that a French authority on Turkish languages was consulted to establish that the Turkish songs were in fact set on pseudo Turkish gibberish. 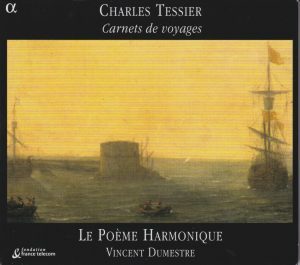 The recital also intersperses Tessier’s pieces and some that are not from him: the two instrumental popular dances, “bransle de village” and “bransle de Lorraine” (tracks 4 & 5) and the slow and melancholy dance “Les Gascons” (track 13) from the 1690 collection by Philidor of “ancient airs played at the coronations, marriages and other solemnities occurred under the reigns of François 1er, Henry 3, Henry 4 and Louis 13”, to illustrate the mixture of the popular and the learned, of “rusticity and delicacy” so prevalent at the time; a pavana composed by landgrave Maurice de Hesse himself (track 7), not only a great friend of music and patron of musicians (he offered a position to Dowland, who declined in favor of the offer of Christian IV prince of Denmark, but praised, in his first book of ayres, the “princely vertues” of the landgrave) but himself a composer; a popular air by Leo Hassler, also a protégé of landgrave Maurice, from his 1596 collection “New German Songs after the manner of the Italian Madrigals and Canzonettas” (track 6). The possible relation with Dowland is illustrated by one instrumental piece of Dowland, the “earl of Essex galiard”, from his collection “Lachrimae or seven teares” (track 11) and an air from the 1597 collection, “burst forth my tears” (track 12). 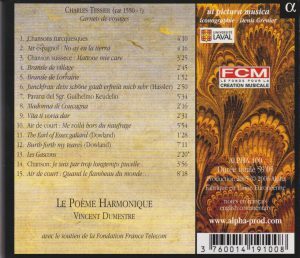 Poème Harmonique under Vincent Dumestre plays all this with verve, enthusiasm and refinement. Very thorough liner notes, texts of songs included with original spelling (a particular delight for those with the polyglot skills to take delight in such things) and English translations, TT 59 minutes.